Hugh Jackman actually holds the record for playing the same superhero the most times in a live-action film franchise - having already portrayed Wolverine in five movies with two more on the way - but apparently that wasn't enough to get the attention of the geek masses at San Diego Comic-Con. As you can see in the video below, around the 46 minute mark, this past Saturday the actor admitted that at one point during this year's convention he actually took to the streets in his full Wolverine costume and barely managed to get anybody to notice. Weirdly, this is actually the second story like this to emerge out of this year's Comic-Con. 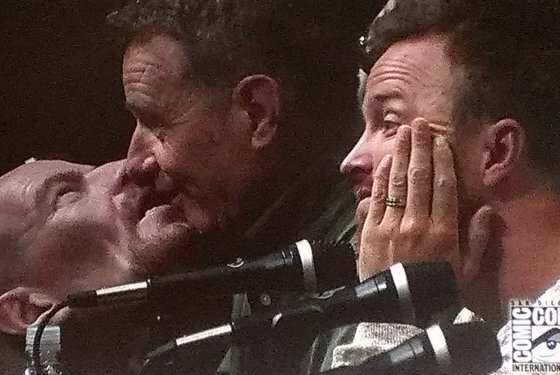 On Sunday, Bryan Cranston revealed to the audience during the Breaking Bad panel that he had actually been walking around the convention center wearing an insanely life-like Heisenberg mask and using a high-pitched voice to disguise his identity. The difference between the two actors' stories is that Jackman never got the opportunity to make out with himself in front of thousands of people (image via Vulture). Jackman's story sounds kind of fantastical given how incredibly popular he is, but having now attended San Diego Comic-Con for the last four years I can tell you that it's actually a fairly believable story. Between the insane crowds, all of the rushing around and the dank smell of nerd sweat that lingers in the air, it's occasionally hard to fully process your surroundings. Jackman's line about a fan saying that he's "too tall" may be a bit of an embellishment, but I could buy that his story is based in some kind of truth. After all, Charlie Chaplin actually did once lose in a Charlie Chaplin lookalike contest. For those that missed it, the 20th Century Fox was reportedly one of the most memorable of the entire five-day-long convention. Jackman was actually pulling double duty as Logan on Saturday, as he was there to promote both James Mangold's The Wolverine (which arrives in theaters this Friday) as well as Bryan Singer's X-Men: Days of Future Past - where the Aussie star was joined on stage by the likes of Sir Ian McKellen, Sir Patrick Stewart, Jennifer Lawrence, Michael Fassbender, James McAvoy, Nicholas Hoult, Anna Paquin, Ellen Page, Halle Berry, and Omar Sy. Also on stage during the presentation were director Matt Reeves, Jason Clarke, Keri Russell and Andy Serkis, who presented the first ever footage from the highly-anticipated sequel Dawn of the Planet of the Apes. For a full recap of the entire panel, be sure to check out Sean's live blog. Click here to get the latest news on Bryan Singer's X-Men: Days of Future Past!